"Love can carry us through all of this. It doesn't age. Its back doesn't go out. It doesn't get arthritis, or need a motor. It doesn't lose its hearing or become forgetful. It is what keeps on when the years get late and our hair is grey. It's what can heal and buoy us through anything. I want to be old with you, yes, but I want to feel young with you forever." I finished reading the words and found myself speechless. I was a single mother, yet this selfless bachelor had come into my life, and he had literally changed everything. I'd never known a love like this. Average romance..... good for a long trip. Give it more action it was slow at different points in the book. What three words best describe Courtney Parker’s voice? Did A Stranger's Kindness inspire you to do anything? Light Slow Friendship That Develops Into More. The story was light and fairly easy to follow. Gina's behavior was a bit puzzling to me at times. It is not surprising her "boyfriend" was stringing her along. He was married!!! IMO Someone with children should never get involved with a married person! The narration was ok but needed more emotions and differentiation between characters. I found myself getting distracted at times. Mark is a kind person and different than all the men she has gotten involved with. She has some growing to do before getting into a serious relationship. This is a laid back romance with very little drama. It has a HEA conclusion. What did you love best about A Stranger's Kindness? The characters are very human and feel true to life. All of the main characters (with the exception of the Schmuck) are very likable and have great personalities. This story is very uplifting. I could see it as being inspirational to people trying to heal from sour relationships or anyone needing a little bit of chicken soup for the soul. That said, I am very confident that most anyone would enjoy this title and especially if they're looking for a well-written and fun romance. The writing really struck a cord with me from the beginning and I'll admit that I did tear up a couple times while listening. It's too hard to choose. They all have their merits (except the Schmuck - screw him). There are so many good scenes! One that made me laugh was when Mark takes Gina and the kids to meet his inquisitive grandmother. The narrator, Courtney Parker, does a fantastic job reading this. I don't think they could have cast a better reader. Her voice is beautiful and perfectly fits the role. This was worth the time spent listening to it. I have to highly recommend this one. This title was very refreshing. I will definitely be looking for more from both this author and narrator. Loved this story! It follows the evolution of the character's relationship from friends to lovers over years. I love how they bring in other characters in their lives especially her children. A very moving story, I laughed and I cried. The narrator was excellent. I received a free review copy of this audiobook at my request and I have voluntarily left this review. ☂️ This book introduces us to Gina, a divorced, single mother of 2. She is sleeping with a man who promises he is going to divorce his wife. Gina is starting a new job as a security guard on the graveyard shift. The 1st night she is working she sees a man who is very attractive. She will end up finding that the man is called Mark and after developing a friendship with him, she must reevaluate her priorities – as well as morality. That is the basic backdrop. I didn't particularly care for the heroine, in the beginning her behavior was selfish and seemed to be without thought for her children. Mark is a saint and puts up with a lot of crap. Other characters add a lot of depth to the story. The voice performance was very good. Courtney Parker was able to perform the male characters in a believable manner. The female characters seems to come easily to her. Overall experience is 4 stars as well. Thank you for taking the time to read my review. If you found it helpful, would you take a moment and select – yes – below? Consider following me on Audible, as well. Thank you! Love can be found in a stranger's kindness! I fell in love with this book right from the start. I loved all the characters and the book has reminded me that love can be found from the kindness of a stranger. 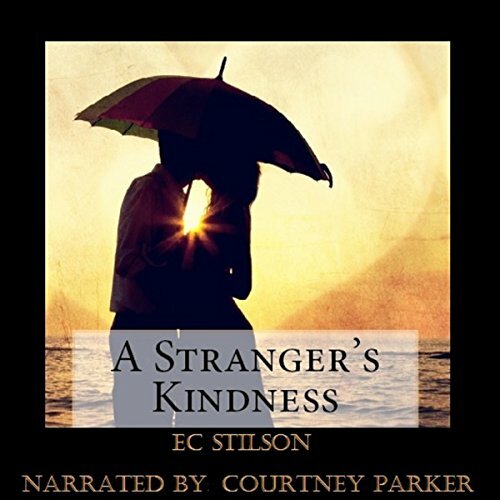 What other book might you compare A Stranger's Kindness to and why? I cannot think of a book to compare this one too. "Love can be found in a stranger's kindness"
As a Guy of a Certain age, I am not the intended audience for this book but I was really interested when I read the blurb. I enjoyed the story as I could relate to the male character dealing with the single mother main character who has emotional issues and makes the wrong choices over and over placing her emotional needs before her children. And not seeing that the good guy in her life could be the right guy. But since he may want a biological kid of his own write him off without even talking to him. Listening to this was a surreal experience because this was something I experienced as the male character. I really enjoyed the narration by Ms. Courtney Parker. She does solid work on the performance. Not certain what I expected! I think I was born in the wrong decade to appreciate this book. Parts of this book I really enjoyed and parts grated on me. I cannot imagine dating someone if they were still married. I think if they have not shed their baggage, run away as they might never get divorced, is called letting go and escaping! I thought the female lead character was shallow and immature even though she was in her 30's. Both the author and narrator were new to me. I was provided with this review copy audiobook at my request and have voluntarily written this review. Gina had issues with her self image. She didn’t feel she was good enough or deserved to be with someone who was good. This caused her to make some bad choices... then she met Mark. It’s amazing how things can change with a little kindness from a stranger. I loved seeing how things progressed through the story and ultimately how things ended up. Ah...what can I say about this book? It was...just...lovely, amazing, incredible and romantic. The narrator was great - enjoyed listening to her. Her voice was perfect for breathing life into this story.